The Ignatius Ajuru University of Education, IAUE Matriculates Three Thousand, Two Hundred and Thirty-Three [3,233] Students for 2017/2018 Session, Management Institutes One Million Naira Annual Cash Prize for Best Graduating Student. 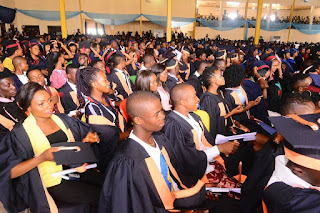 A one million naira annual cash prize for the best graduating student has been instituted by the management of Ignatius Ajuru University of Education, just as 3,233 fresh students have been admitted into the university. The Vice-Chancellor, Professor Ozo-Mekuri Ndimele disclosed this at the 9th matriculation ceremony of the university on Saturday, April 21, at the university auditorium. He reminded the students that the time to lay the foundation towards winning that prize was upon their admission, assuring that management was looking forward to handing over the cheque to one of them on their convocation. He disclosed that the university has in the past one year established a postgraduate school which has been adjudged the most efficient in the south-south, and now offers degrees in Bachelor of Arts (B.A) and Bachelor of Science (BSc) in some critical subject areas of its core mandate. The university has also introduced an International School of Business and Economics which will commence full academic session next month. Meanwhile, the university has won the 2018 edition of the “International Festival of Contemporary Dance-University Performing Arts Competition”, involving all universities in Nigeria. Other innovations introduced by the new administration include school-and-work scheme to provide jobs for some indigent students to earn money to pay their bills in school, optimal engagement of the Department of Technical Education in the repairs and construction of classrooms, desks and chairs, thereby enhancing the skills of the students in their areas of study. To augment grants from government, the university has established a 160,000 capacity demonstration fish farm; the largest in the state, as well as a large vegetable farm, a printing press, an ultramodern digital x-ray centre, amongst others. Professor Ndimele also assured that the new ICT building would be ready soon, while plans have been concluded for the construction of separate building for the Faculty of Business Studies, as the Faculty of Education building would be ready by the second semester this year. He cautioned the fresh students to shun involvement in examination malpractices, secret cults, and other vices as those caught would be rusticated and commended parents for providing sound education to their children despite the harsh economic situation. The VC also commended the governor of Rivers State, His Excellency, Barrister Nyesom Wike, for investing heavily in the education sector and for providing a peaceful atmosphere for businesses to thrive in the state. Others are the Commissioner for Education, Dr Tamunosisi Gogo-Jaja and the Chairman of House Committee on Education, Dr Farah Dagogo for their unreserved commitment to the university.